Both a breath of fresh and air and a punch to the face, Goon, the 2011 ice hockey comedy, was an unlikely hit and welcome throwback to a sport sparingly made for the movies. Among its pleasures included its dumb but loveable protagonist Doug Glatt (Sean William Scott), his salty arch-nemesis Ross Rhea (Liev Schreiber) and a visceral love for the “enforcer,” the more professional euphemism for the movie’s title, a player whose primary purpose is to leave opponents and their stadiums with broken teeth, split lips and blood-stained ice. Based on a true story, adapted by writers Jay Baruchel and Evan Goldberg, this small gem gave the black sheep of the sport a worthy platform. 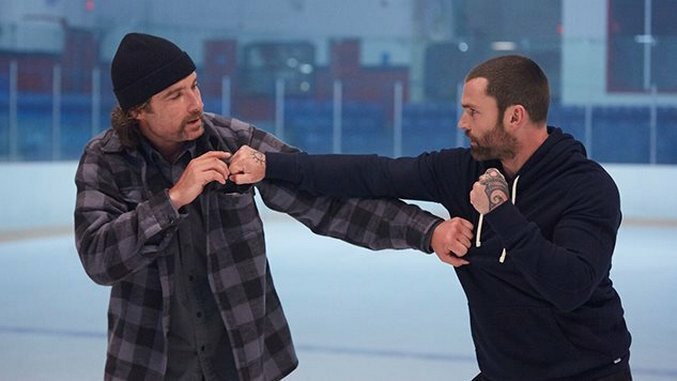 Six years later, Baruchel makes his directorial debut with Goon: Last of the Enforcers, expanding this small Canadian universe and extending the story of its affable pugilist on ice. Baruchel, returning as a co-writer with Jesse Chabot, sticks to the clichés of the genre to guide him through a slightly more nuanced depiction of Doug (thanks again to an understated performance from Scott) and his minor league team, the Halifax Highlanders. Relying on well-tread story arcs is usually a symptom of most sports movies, but Baruchel knows that leaning on the familiar beats of a redemptive sequel can still provide comfort, especially in the bruising arena of hockey. The movie’s predictable arc only works because Last of the Enforcers isn’t explicitly a re-hash of its predecessor. Just as there’s been a considerable gap between installments, Baruchel makes sure to concern himself with Doug’s next chapter as an aging athlete: mortality. After seeing her husband take a blood-spattered beating from new nemesis and hotshot enforcer Anders Cain (Wyatt Russell), Doug’s pregnant wife Eva (Allison Pill) asks him to leave the Highlanders for the sake of their new family. He obliges and finds “safe” work at an insurance company, watching his team suffer without him. His absence leaves the team without a captain, but when Cain takes his place, sewing discord among teammates and coaches, Doug can’t help but feel destined to return to the ice. Like in Rocky II, he enlists the help of his former rival Ross (another wonderful performance from Schreiber), whose career has succumbed to fighting in underground “Bruised and Battered” competitions, bludgeoning cash-strapped former hockey players on the ice in front of boozed fans. Doug rehabs and trains his way back to the team, where he must confront the teammate that nearly ended his career. As was the case with Goon, Last of the Enforcers revels in a hockey culture that Baruchel knows intimately, exhibited in the crude locker room banter from some of the returning players. Their jokes hit and miss, however, and part of this movie’s problem is that it treats them as a Greek chorus of caricatures as opposed to anything deeper. It spends its pathos instead on Doug and Ross, two men contemplating their undying love for a sport that, in their middle age, persistently refuses to love them back. There is a more interesting movie in here, one that explores the nature of those backyard brawls on ice, where the extinct enforcers re-live their glory days through frozen violence. Instead, Last of the Enforcers keeps the narrative skating. Baruchel’s strength as a first-time filmmaker comes in the actual hockey and fighting scenes, which, compared again to Goon, ratchet up the intensity and momentum, offering something more visually enticing and inspired (blood spattering from players’ mouths is exaggerated to perfection). He also leans on Russell, a former hockey player himself, who is a natural on the ice but starts as an odd choice for a villain, negotiating silliness and lunacy that lacks any real gravitas. It’s not until halfway through the movie, when some of his daddy issues emerge (his father, played by Callum Keith Rennie, owns the Highlanders) that his more sadistic side enlivens the third act. Amidst some of the violence and cruelty inflicted—and the intermittent, ludicrous quips from a hockey commentator played by T.J. Miller—Last of the Enforcers’ real strength is that it doesn’t forget Eva, nor does it corner her into a nagging obstacle in the way of Doug’s ultimate joy. She, taking advice from her drunken friend (a hilarious Elisha Cuthbert), plays an integral part in Doug’s unlikely journey into minor league hockey. Their relationship with a newborn is tested and grows, but it’s never pushed aside or treated with condescension, which gives this sequel some unexpected soul hiding beneath its black eyes and crimson noses.